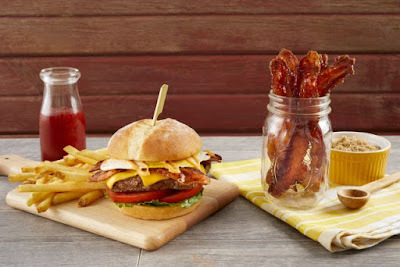 For those that think brunch should be available at all hours, Bob Evans launches a new brunch menu, featuring items like Candied Bacon and Pot Roast Hash, that's served all day. - Bob Evans Burger - A 100% Black Angus bacon cheeseburger topped with a fried egg and Sriracha-avocado mayo and served with French fries. - Candied Bacon - Hardwood-smoked bacon coated with brown sugar. - Sticky Bun Bake - A French toast bake made with Brioche bread and candied pecans, topped with praline sauce and cream cheese icing. Fresh cut fruit and a choice of breakfast meat are included. 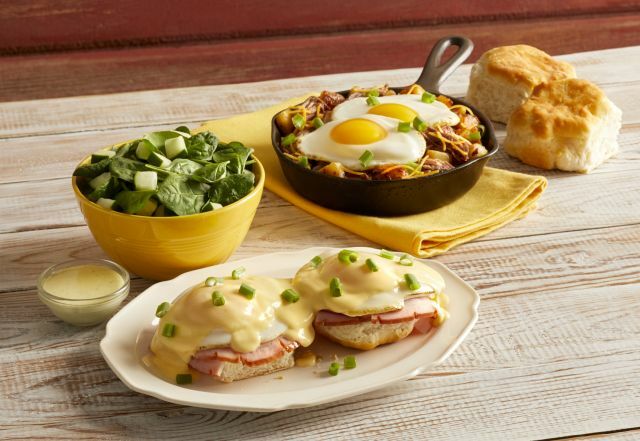 - Ham Biscuit Benedict - A freshly-baked biscuit split and topped with hickory-smoked ham, two eggs cooked-to-order, hollandaise sauce, and scallions. A spinach side salad with Green Goddess dressing and a choice of hash browns or home fries are included. - Pot Roast Hash - Slow-roasted pot roast with home fries and cheese, topped with two eggs and a choice of freshly-baked bread. - The Green Goddess Salad - Fresh romaine and spinach tossed with hardwood-smoked bacon, hardboiled egg, cucumbers, and grilled chicken. Served with Green Goddess dressing and a choice of freshly-baked bread. - Chicken and Waffles - Fried chicken tenders and a waffle topped with praline sauce and bacon bits. Prices vary with location but generally range from $8 to $10 for the entrees (and around $4 for the bacon).